Just few days after Twitter officially rolled out 280 tweet character limit, the popular social network has now increased the characters of display names to up to 50 chars (including emojis) on its platform. 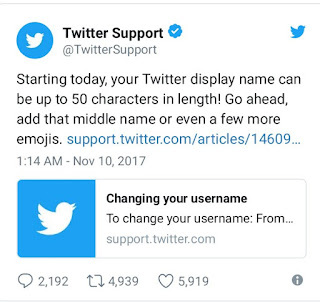 Before now, Twitter display name could only contain 20 characters, but now, the uplifting news is you can have longer display names on Twitter now. 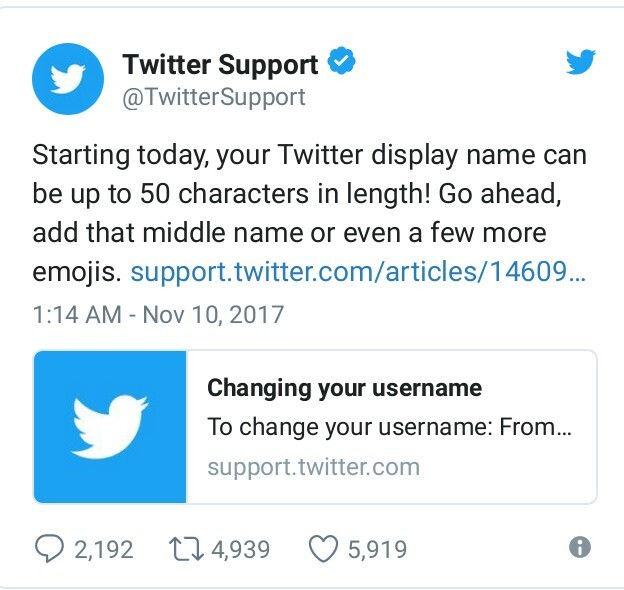 If you have wanted to change your display name on Twitter to a more longer name, then this is the time as Twitter display name can now contain 50 characters. Twitter has been releasing quite some interesting features and as well deviating from its core tradition of keeping things short. Starting from the increased 280 characters for tweets and now increased 50 characters for display names. "Starting today, your display name can be up to 50 characters in length! Go ahead, add that middle name or even a few more emojis." Meanwhile, your username — the handle beginning with "@" that other people use to mention you — can also be changed, but it still has 15 characters limit. Good they're finally shifting grounds. Twitter is doing great these days. Those long names would fit in.